Recently, we reviewed the Allen & Heath ZEDi-10FX — a small format mixing console that doubles as a desktop interface for those looking to do a spot of recording too. While we were skeptical at first, we most certainly were won over — and in the end gave it a huge 9/10. 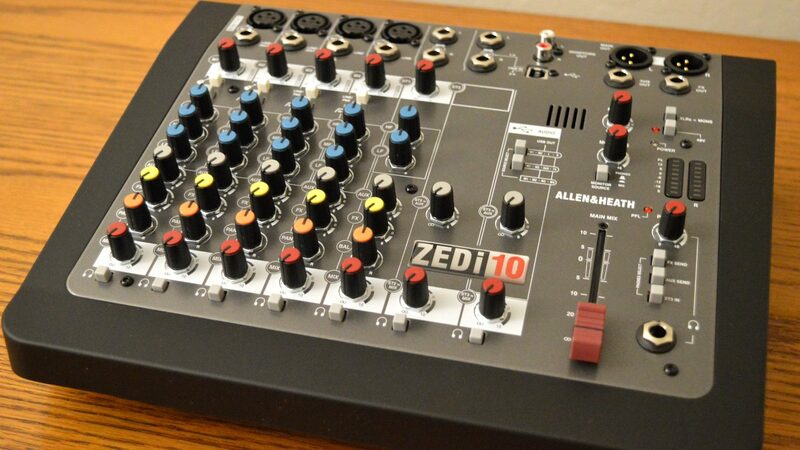 But the ZEDi-10FX actually has a somewhat less functional sibling — the Allen & Heath ZEDi-10. You might be able to guess what the difference is between the two — the FX has an FX section. The standard ZEDi-10, on the other hand, is exactly the same but without the FX, and it comes at a smaller price. Considering the two consoles are so similar, you might find us repeating ourselves a little from the ZEDi-10FX review. 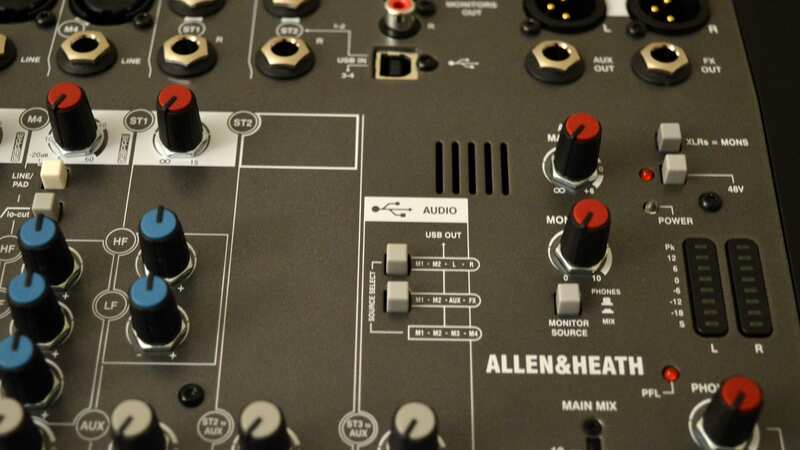 Allen & Heath has never been known for its design, but its gear has never looked bad either. That tradition seems to continue a little with the ZEDi-10, which most certainly looks more functional than beautiful. As would be expected from a console of this kind, the left side is dedicated to your channels. You’ll get four mono mic/line inputs, as well as three stereo inputs. All of the four mono inputs offer XLR and balanced/unbalanced TRS inputs, while the stereo inputs stick to TRS. The first two channels also offer a “guitar mode,” which basically engages high impedance inputs, which cuts out the need to bring your own DIs on the road. The other two channels replace the guitar mode button with a Line/Pad button — one that cuts the input level by a handy 20dB. Directly under those buttons, on all four channels, you’ll get a low cut filter, which sits at around 100Hz. Next up are the EQs, and you’ll get a high, mid, and low knob on all four of the mono channels, while the first stereo channel is decidedly less equipped with only high and low knobs. The remaining knobs include an aux send, FX send, panning, and an overall mix level. The aux send is pre-fader, while the FX send is post-fader — just something to keep in mind while in use. The second stereo channel can serve as either another stereo input, an FX return or a USB return from your DAW. The third and final stereo input can only be taken from USB, and used to blend with the aux bus or mix bus with PFL. In the middle of the console, instead of finding the FX section, you simply have a little blank space. There’s nothing wrong with that — but it’s clear the ZEDi-10FX was designed first and the standard ZEDi-10 is simply riding on the coattails of its more expensive sibling. We really kind of like how the console looks. Sure, it’s not going to win any design awards, but like we said, it’s more functional than beautiful, and that’s perfectly okay. Using the Allen & Heath Zedi-10 is pretty damn simple, as you would probably expect. All you need to do is plug it into your computer and get recording if you’re using it in a studio setting — and once you plug it in your DAW should pick it up very quickly. We used it with Pro Tools with no problems at all. Simply plug it in, boot up your DAW, and it should be picked up and good to go. There are a few things to keep in mind while using this console. 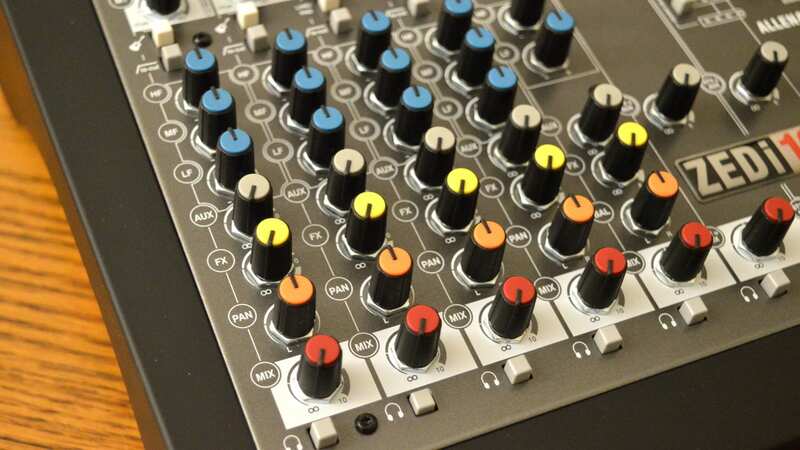 For example, plugging in to the second stereo input cuts the mixer’s USB signal — so remember to avoid doing that if you want to keep your mixer connected to your DAW. Allen & Heath told us that users can also configure the DAW return to be on ST3 instead of ST2 through a firmware update. Apart from little things like that, however, the Allen & Heath ZEDi-10 is a very capable and useful little mixer. We tried recording a range of different instruments on the console, and while we’ll go into how that sounded later on, the experience was very fluid and easy. The GSPre micr pres have a ton of headroom for almost all situations, and the EQ’s, which have a smart Q that’s automatically controlled by the console, are absolutely simple. Last but not least, the Allen & Heath ZEDi-10 is built to last. It should be able to handle most of the reasonable abuse you can throw at it, which is good news considering the people who will buy a small-format console like this are probably people who are also on a budget. Looks, design, and usability are only part of the equation — the console also needs to sound good, and thankfully it does. Let’s start with the GSPre mic pres, which actually sound pretty nice. They’re very clean mic pres — which is a good start for those looking for a budget mixer/interface combo, as it means that you have a little more control over the sound in the box. Not only that, but the pres have a low noise floor — an important thing to consider in both live and studio situations. The EQ certainly don’t give you as much control as you might want, but they sound pretty good nonetheless. There’s no denying that in studio situations you may want to rely more on plugins for your EQ needs, as you’ll be able to get much more surgical. In live situations, however, the ZEDi-10 is more than capable — sure, you don’t get to set the Q, but the Q the console sets for itself is very musical. 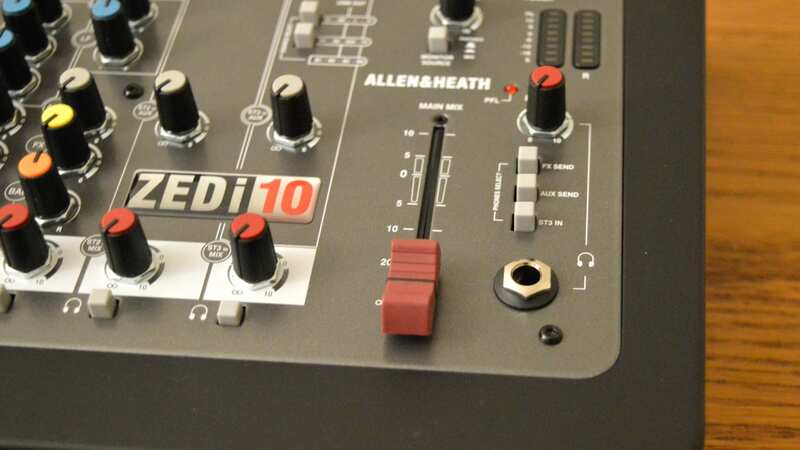 The Allen & Heath ZEDi-10 isn’t perfect, but for the price it’s a solid option. If you have an extra $50 to spare, we highly recommend springing for the ZEDi-10FX — but if not you’re not going to be disappointed with this option.